In the healthcare sector, 2D barcodes are becoming increasingly more prevalent on samples, patient files and blood bags. The Honeywell SF61B HC offers full flexibility in the electronic data capture of barcodes, since it reliably and quickly reads both 1D and 2D barcodes. Thanks to its integrated Bluetooth module it offers users the highest degree of flexibility and independence on space limitations. With a range up to 30 m with a clear view up to 100 m you easily cover the entire station. Thanks to its compact form, healthcare workers store the scanner as needed in their lab coat pocket shortly, in order to have both hands free. Mobile 2D barcode imager for clinics, laboratories, etc. 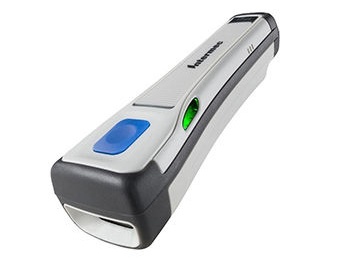 The SF61B HC barcode scanner is fully compatible with all iOS, Android and Windows mobile devices. This allows for versatile usage without regard to the platform. The integrated triple good scan feedback effectively supports workers in every environment and removes all doubt about a successful scan. Your choice between an acoustic, haptic and optical signal offers the appropriate mode for all environments, even in noise-sensitive patient rooms.